Summary : If you and caffeine don't get along, but you love spiced black tea, well, your problem is solved. Tazo's Decaf version of its chai spiced black tea tastes basically the same as their non-decaf version...and is very good. Review : I really loved Tazo's Organic Chai Spiced Black Tea. I loved the spice in it. I loved the eye-popping flavor...mainly because I'm a spice and pepper junkie. Yet, I had been putting off tasting Tazo's Decaf version of their chai spiced black tea. The reason? Simple. I loved Tazo's Green Tea, but despised their Decaf Green Tea. And so, dimwit that I am, I just naturally assumed that this decaf chai tea would be just plain miserable. So yea, call me stupid. Call me chicken if you want. Whatever! But regardless of what you want to call me, on a late evening in December I worked up the courage and gave this tea a try. And, umm, surprise! The Chai tea from Tazo contains the following ingredients : decaffeinated black tea, rooibos, ginger, cinnamon, chicory, black pepper, cardamom, cloves, natural flavors and star anise. As you can see, this tea has quite the shopping list of ingredients. Here is how Tazo describes this tea : "Throughout India, chai wallahs can be found serving cups of decaffeinated chai to souls who naturally seek inner beauty at a slightly gentler pace." Well, my first question, even before I opened up the foil bag the tea is wrapped in, what in the world is a chai wallah? Sounds like some kind of spunky medicine man that performs a rhythmic dance. In fact, just for your inner store of reference, a chai wallah is simply a "tea maker." Guess Tazo wanted to impress us with their fancy language? Anyways, once my internet research was out of the way, I opened up the tea and was greeted by basically an identical aroma as found in Tazo's Non-Decaf Chai Spiced Tea. It smelled good, it smelled spicy, and I allowed my hopes to soar...as I really was in the mood for something with kick in it! Happily, this tea didn't disappoint. In fact, to be very blunt, I couldn't taste a bit of difference between this tea and the non-decaf version. And to me, that is a real good sign - especially after my dismal date with Tazo's Decaf Green Tea! Similar to the non-decaf version, this spiced black tea is best served "as is." In other words, put your tea additives somewhere else...anywhere else in fact but in this tea. Additives will just make this tea taste strange and will remove the spicy flavor found in it. Overall, if you like spicy black teas, decaf or otherwise, well...I have a tea for you. 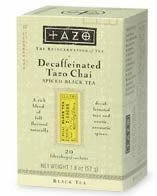 And it is called Tazo's Decaffeinated Chai Spiced Black Tea! Recommendation : Yes. This is an excellent chai tea, despite being decaf. Tastes bascially the same as Tazos non-decaf version of this tea...which is a good sign for me. To sum it up, if you like spicy teas, you'll like this tea. Simple, huh?